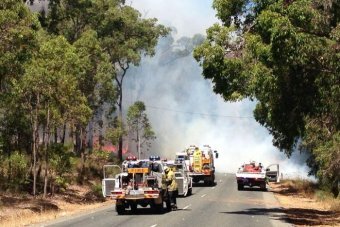 More than 20 homes may have been lost in the Perth Hills area in Western Australia as firefighters battle an out-of-control bushfire. Emergency warnings are in place for the fire, which started this morning in Parkerville and moved rapidly to surrounding areas. It is currently burning in a number of suburbs including Parkerville, Stoneville and Mount Helena. Russell Jones from the Department of Fire and Emergency Services (DFES) says more than 20 homes may have been lost, though the exact number remains unclear. 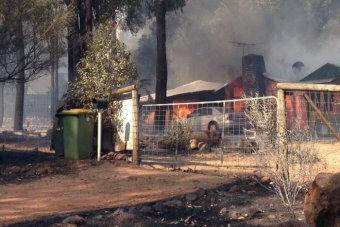 “The fire is still out-of-control and uncontained,” he told ABC local radio. He says some firefighters have gone down with heat exhaustion with hot temperatures making fire-fighting extremely difficult. He says sightseers must stay away from the area. The fire is throwing embers and has flames of 20 metres high. Homes have been evacuated and people have fled to emergency centres. Mr Jones says he hopes a drop in winds and a cool change overnight will help firefighters control the blaze. One local resident, Peter, has told ABC local radio embers are falling onto his home near Mount Helena. He planned to secure his horses and grab a few essentials before leaving his property. “We are going to get the hell out of here. We are leaving everything,” he said. “We are just taking our animals, our main clothes; we’ve got our tax files in a box. That’s it. Another resident, Gavin, evacuated from his parents’ home. “I saw the orange helicopter, it was probably two properties down, so it is coming towards that area, Mount Helena, pretty quick,” he said. Water-bombing planes are at the scene along with 70 crews from 17 brigades. DFES says the fire could burn for days, and extra resources are being organised. Road closures are in place including Richardson Road.